Designed to operate over a wide range of flows from 1.5 feet (.5 meter) to 16 feet (5 meters) per second and consistencies from 1.5% to 16%. Unique sensor design allows transmitter to accurately measure consistency over changing production rates and varying pressures to ± .0075%. 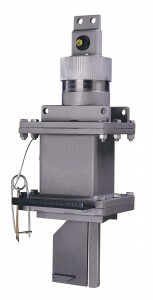 The pipeline module can be easily and quickly installed and withdrawn without process shutdown.